White House Press Secretary Sean Spicer often has to put a good shine on bad news. He'll also blatantly refute provable facts in his daily press briefings, like he did with the inauguration. 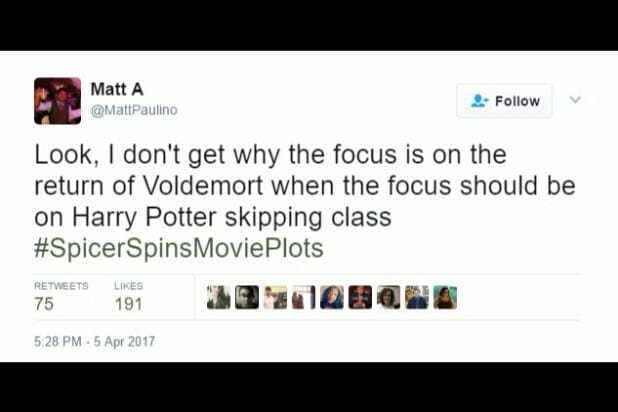 Twitter users tried putting Spicer's spin on movie plots, and the results are hilariously pro-villain. 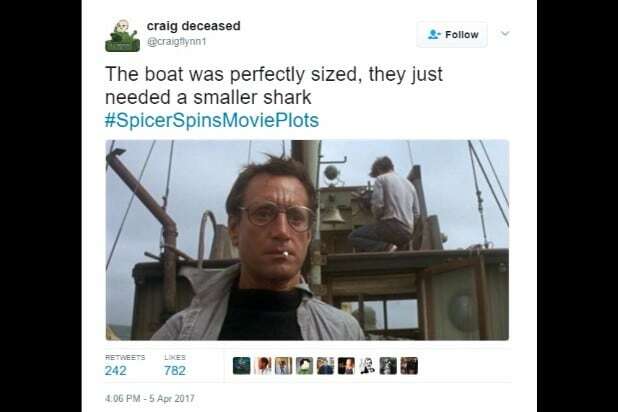 There was absolutely nothing wrong with the boat in "Jaws." It was a great boat. Tremendous. By @craigflynn1. The "Harry Potter" movies chronicle the story of a kid who never followed the rules, but nobody reports on that. By @MattPaulino. As with the Dakota Access Pipeline, the official White House position on "Avatar" is that infrastructure work on Pandora. It'll create thousands of jobs and use American steel. Well, maybe. By @decadent_creed. Nobody is even talking about what actions Baby took that could have provoked the corner-putting in "Dirty Dancing." By @ShakeItSister. "A New Hope" is "Star Wars" #fakenews. By @MarshallSbar. The field from "Field of Dreams" was crippled by government regulation and no one showed up. Sad! By @harbaughspecs. Even San Francisco Rep. Eric Swalwell got in on the #SpicerSpinsMoviePlots action. Has anyone in "The Lion King" actually seen Simba's birth certificate? There are no ethics concerns when it comes to the Corleone family business in "The Godfather." By @MarzClaire. Just look at the photos. The tree from "A Charlie Brown Christmas" was the biggest ever. Period. By @mb_519. The Jedi of "Star Wars" want to hurt the Empire's way of life, folks. It's a mess. Believe me. By @HouseoftheDread. Look, the American people don't care about tax returns in "The Shawshank Redemption." By @decadent_creed. 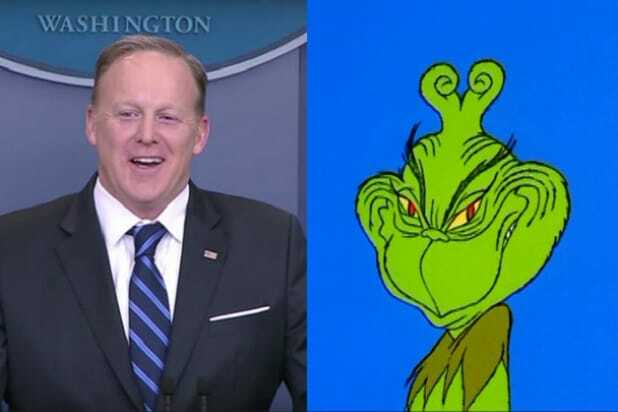 We can talk about "How the Grinch Stole Christmas" but we can't even say "Merry Christmas?" This country is way too PC, folks. By @bigdweeb. "Ferris Bueller's Day Off" didn't happen. He spent the weekend working in the White House. And no, there's nothing to these hacking allegations. By @HangCat25. If these liberal judges would let travel ban were in effect there'd be no need for a "Miracle on 34th Street." By @GCN8TV. When #SpicerSpinsMoviePlots, he just wishes you would focus on the positives of "Hidden Figures" for once. By @Spanky_McMuffin. Not everyone was against "The Hunger Games," you know. Real Americans love the Hunger Games. By @jtbaud24. As #SpicerSpinsMoviePlots notes, "The Lord of the Rings" was about protecting our borders and keeping our people safe. By @goke8456. You're not taking into account all the people who watched Tom Hanks become a "Castaway" online, which makes the crowd the biggest ever. By @HickmanBell5. Illegal aliens like "E.T. : The Extra Terrestrial" are coming into our country, and they're breaking the law and taking our movie theater candies. By @shellbell_xo. #SpicerSpinsMoviePlots secret weapon: When in doubt, blame Obama. "Return of the Jedi" was all his fault, and it doesn't matter if he wasn't a president then. By @DavidYankovich.